You'd better plan for at least a week here! 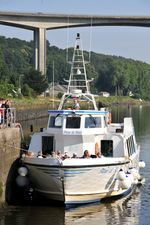 The islands and coast of the Bay of Morlaix abound in striking natural and man-made heritage sites, viewpoints, trails, gardens, and fascinating civic and religious monuments, with plenty of appeal for both young and old. The emblem and centrepiece of the bay! First built in the 16th century to protect Morlaix against incursions by English mariners, then improved by Vauban in the 18th century, the Château du Taureau has at one time or another served as defensive bastion, prison, second home and sailing school base, before being abandoned in the early 1980s. Magnificently restored, it is now open to the public from April to September. You can sail to it yourself or take a boat trip from Carantec or Plougasnou (it is a good idea to book in advance). The Île Louët lighthouse was built in 1857 by Fenoux (the same engineer who built the Morlaix Viaduct) to provide a permanent light source to guide ships sailing into Morlaix Port. A succession of lighthouse keepers and their families lived there until the automation of the lighthouse in the 1960s. Renovated in 2004 by Carantec Council, the lighthouse, outbuildings and terrace are rented out by the council as a gîte from March to October (Tourist Office Bay of Morlaix – Monts d’Arrée). Due to its understandable popularity, bookings need to be made well in advance! However, the magical Île Louët is never closed to the public and remains accessible by yacht even when rented out. An island at high tide, Callot becomes a peninsula at low tide. It can then be accessed via a submersible causeway. Pay careful attention to the tide times! The southern part of the island is permanently inhabited and farmed. The wilder northern part is a nature reserve overlooked by the Notre Dame de Kallod chapel, which originated in the 6th century. 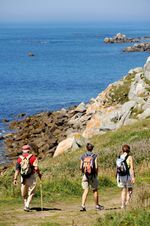 A number of trails criss-cross the island, weaving through maritime pines, ferns, moorland, gorse, alpine sea-holly, and giving breathtaking views over the Bay of Morlaix. The surrounding beaches, seabed and strand are the delight of swimmers, divers and fishermen on foot. 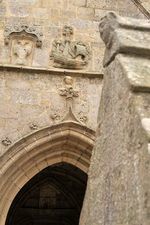 Granite from Callot can be found in numerous local buildings, not least the Tobacco Factory and the Morlaix Viaduct. Covering 3.5 km from east to west, Île-de-Batz (www.iledebatz.com) is a district in its own right with a little over 500 inhabitants. The heart of the island is criss-crossed with small enclosed fields that are protected from the wind and sand by stone walls. The top of the lighthouse (44 m) offers a unique panorama of the island and its varied landscapes: the wild region, cultivated fields, massive dunes, fine sandy beaches, rocky drops, moors and wetlands… On the eastern side of the island, the lush and exotic vegetation of the Georges Delaselle Garden contrasts with the surrounding sea views. This garden of rare beauty also contains the remains of a Bronze Age necropolis. Accessible by foot at low tide via the Barnenez Headland, the pine-covered Île Sterec strikes a contrast with the bare and arid Île Noire, upon which can still be seen the square tower of a working lighthouse. Île Noire is also accessible on foot during high coefficient tides. Being surrounded by oyster parks, it is very much appreciated by fishermen on foot! Locquirec, Diben at Plougasnou, the Penzé estuary, Saint-Pol de Léon and the Old Port of Roscoff offera rich choice of stops for sailors. An association of enthusiasts began organizing guided tours in and around the Bay of Morlaix in 1998. The trips are deliberately varied and include an outing at sea in a motor launch as well as a journey by train, with a professional tour guide to provide commentary on the natural and historical heritage. The association offers around fifty family excursions each year and arranges tailor-made days out for groups and schools. It is a good idea to book in advance (by email or telephone). 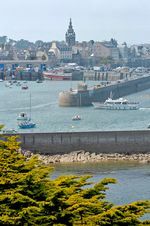 This former privateer city owes everything to its maritime environment, from the purity of the air and water to the mild climate, proof of which can be enjoyed in the flourishing Roscoff Exotic Garden just above the marina. The business of health and well-being first made its appearance in the city in the late 19th century. Why not treat yourself to the benefits of thalassotherapy, or visit the Seaweed Discovery Centre? The Maison des Johnnies pays tribute to Roscoff's onion-growing tradition – which began as a source of nourishment for sailing crews – as well as to the memorable merchants (nicknamed petit Jean or "Little John") who used to cross the Channel to sell their produce in Great Britain. Built before the pyramids of Egypt, in the 5th millennium BCE, Europe's largest megalithic mausoleum sits atop the Kernelehen Peninsula of Plouézoc, quietly overlooking the Bay of Morlaix. This "Prehistoric Parthenon", to use the description of André Malraux, comprises eleven galleried dolmens and can be visited all year round. Both a stronghold and a luxurious country seat, the Château de Kerjean was built at the end of the 16thcentury and, at that time, outshone all the other noble residences in the region. Annual exhibitions and a 49-acre park complete a visit to the galleries, private apartments and kitchens which testify to the elegant lifestyle enjoyed by the lords of Kerjean and their households. Guided tours and interactive material make sure you get the most out of your exploration of the chateau. The hinterland, or "mountain", as local people call it, dominates the landscape of peat bog and moorland, tight little wood and copse that extends to the brink of the sea. Silent and untamed, but easily accessible to walkers and mountain-bikers, the rocky ridges of Roc’h Trédudon and Roc’h Trévezel, as much as the domed silhouette of Mont Saint-Michel, transport one to the heart of a mysterious and legend-filled Brittany. Morlaix Museum (art gallery), Carantec Maritime Museum, Musée du Loup (Wolf Museum) in the Cloître Saint-Thégonnec, Yann d'Argent Art Gallery at Saint-Servais, ecomuseums at Plouigneau, Commana and Saint-Rivoal, Trégor Rural Museum at Guimaëc, Maison de la Rivière (River Discovery Centre) at Sizun, Maison dite de la Duchesse Anne (Duchess Anne's House) and Maison à Pondalez in Morlaix... how many reasons do you need to delve into the historical, artistic and environmental heritage of Morlaix and its environs! Bread, traditional ciders, mead, honey, cheeses and dairy products, shellfish, oysters, meat, fish, vegetables both prepared and unprepared… you can of course buy your food in shops and at the markets, but you're equally welcome to buy direct from a number of local producers. Contact your nearest tourist office for more information. Contact your nearest tourist office for more information.